It has been suggested that this article or section be split into multiple pages or sections. This article is about the Final Destination in Super Smash Bros. Ultimate. For other uses, see Final Destination (disambiguation). Final Destination (終点, Endpoint) is a stage in Super Smash Bros. Ultimate. It was revealed on August 8, 2018. Like its predecessors, Final Destination consists of a single platform with ledges that can be grabbed. Compared to previous iterations, it appears to have crystalline texture with mechanical elements, along with a background traveling through what appears to be space. This iteration of Final Destination is shorter than in past games, now being the same length as Battlefield. This is also true of all Ω Forms. Anytime the stage is loaded, it will start on a different background and if the music to this stage is played backwards you can also hear part of Lifelight. While in Vs. Mode with more than 4 players, the stage itself increases to be 1.5 times its normal size, while increasing its camera boundaries and blast-lines to compensate; this is also stated as a tip in the Stage Tips Section in the game. This also affects all Ω form variations of any stage as well. The boss battles against Galeem and Dharkon use a unique form of Final Destination that has four soft platforms arranged in a diamond formation above the stage. The main platform is also simpler, removing all decorative elements above the stage, leaving just the flat surface. During the first fight with Galeem and Dharkon, the background is fixed to a theme corresponding to the boss on the stage (Galeem’s is fixed on the cream-colored clouds, while Dharkon’s is fixed on the dark nebula). During the final battle, the stage’s background differs from that of the playable Final Destination, that being the sunset-like background seen at the end of the opening movie. When either Galeem or Dharkon is close to defeat, the background changes to another unique background, being two still nebulae, one cream-colored and the other black. There are also two unique backgrounds on this stage, one each for after either Galeem or Dharkon have been defeated, but the other one is still standing. Galeem’s resembles a bright nebula, while Dharkon’s resembles red, stormy clouds. The vertical scrolling stage just prior to this fight, as well as the boss selection arena just prior to actually encountering Galeem and Dharkon also appear similar to this version of Final Destination. Final Destination itself can be selected as an Ω form, but doing so is identical to selecting the normal form. 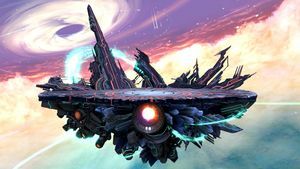 The Battlefield form of Final Destination is identical to its regular form, but it has the addition of three soft platforms that are unique to this form and are based off of the ones when fighting Galeem and/or Dharkon in World of Light. It is also the same exact design when fighting 50 false characters as Master Hand in World of Light. Like in previous games, Final Destination is considered a legal starter stage in tournaments, owing to its simple layout and lack of any disruptive stage hazards. Final Destination with dark background. The dynamic background of Final Destination. Final Destination's unique form when battling against Galeem and Dharkon in World of Light. Fox holding a Black Hole item on the stage. Fox throwing the Black Hole item. The Ice Climbers using Blizzard on a Metroid on the stage. Ken using Shinryuken on the stage. Ryu and Duck Hunt on the stage, ready to fight. The start of the match on the stage with Mii Brawler and King Dedede. The start of Sudden Death on the stage with Mario and Luigi. In the E3 2018 demo build of Ultimate, selecting Final Destination would load the Ω form of Battlefield instead. In the E3 demo, the beta version of Battlefield’s music is heard in Final Destination. The E3 version of Battlefield’s theme was arranged on a computer, while the final version is arranged by the Smash Bros Ultimate Orchestra. Playing the stage's main BGM track in reverse reveals it to be a unique variation of Lifelight. This is the first Final Destination stage to have background decorations above the surface of the platform. The opening movie for Ultimate features Galeem and Dharkon’s variant of Final Destination at the end. This and Corrin’s congratulations screen are the only time the stage can be legitimately shown without either of them. The blast lines of this version of Final Destination are slightly uneven, with the left side being a little further back then the right side. This results in characters being KO'd roughly 2%-4% later from the left side compared to the right. Nikki is the only Assist Trophy to not be compatible with this stage, probably because of her drawings blending in the background. This page was last edited on April 18, 2019, at 13:22.